Blurred vision can be temporary or chronic, and in some cases, people can experience blurred vision in only one eye. To properly manage blurred vision, you have to understand the underlying cause. Here we examine what causes blurred vision in one eye as well as the symptoms and potential home remedies. Blurred vision is best described as a loss of sharpness or a foggy view. Some people are lucky in that their blurry vision can be corrected by simply wearing glasses. For others, it isn’t that simple—it could be a sign of a serious health issue. What is blurred vision in one eye? Blurred vision in one eye can be the result of crying or rubbing the eye. It can also be due to something serious, such as brain damage. Thankfully, in the majority of cases, a refractive error such as near-sightedness or far-sightedness is responsible for blurred vision. The correct eyeglasses or contact lenses fix the problem. Sudden blurred vision in one eye can be a sign of a medical emergency if it is experienced along with other symptoms, including pain and weakness. Blurred vision appears alongside reduced sharpness, which makes it difficult to see fine details. Someone with myopia—nearsightedness—can’t see distant objects clearly, but will be able to see fine when doing up-close tasks like reading a book. Without corrective glasses or lenses, myopia can cause headaches. In the case of far-sightedness (hyperopia), objects that are near are harder to see and distant objects are clear. Of course, our eye health affects the quality of our lives. If you have blurred vision in one eye or both eyes, you should see a health care provider to figure out what the cause is. What causes blurred vision in one eye? What’s causing your blurred vision depends on individual circumstances. For some people, the decreased vision can be due to excessive tear production or even from dust or debris getting in the eye. Dry eyes can also cause blurred vision. Dry eye can be age-related or due to underlying conditions, such as the autoimmune disease Sjogren’s syndrome. Optic neuritis—inflammation of the optical nerve. Can begin in one eye, but progresses to include blurriness in the other eye. Migraines—some migraine sufferers experience blurred vision in one or both eyes during a headache. Injuries—any injury to the eye, such as being hit by a ball. Diabetic retinopathy—this is a complication of diabetes that happens when blood vessels in the retina are damaged or swollen. 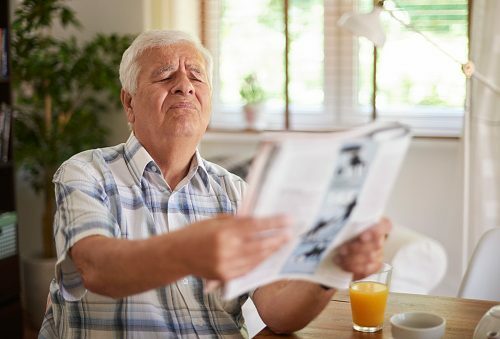 Age-related macular degeneration—as we age, the eyes are more prone to deterioration and may not be able to form a clear image. Cataracts—this is a complication of diabetes that leads to blurred vision. Glaucoma—a condition that is characterized by damage to the optic nerves. It is usually as a result of increased pressure on the eye. Stroke—sometimes a stroke can cause blurred vision in one or both eyes. Transient ischemic attack—temporary symptoms that could be a warning sign that a stroke might be coming. Uveitis and iritis—inflammation of the eye structures. Tumor—a tumor could be in the brain and may be putting pressure on the optic nerve, leading to blurred vision. In the majority of cases, blurred vision in one eye is not the result of a serious condition. In rare situations, it can be linked to disease or other condition that needs careful treatment. When left untreated, serious blurred vision cases can result in permanent vision loss or life-threatening complications. If you experience blurred vision in one eye or both eyes, you should seek medical attention to determine the cause. Once you are diagnosed, it is important to follow the treatment plan that you have been given so you can avoid complications such as blindness, infection, the spread of cancer, unconsciousness, or brain damage. When someone has blurred vision in one eye, they can experience several different symptoms along with the blurriness. The following list covers some of the most common signs and symptoms associated with blurry vision. There are symptoms that are less common and can be a sign of a more serious condition. For instance, changes in alertness, passing out spells, confusion, fatigue, weakness, and pain in the eye can be symptoms of a much more severe or life-threatening situation. Some people may also experience severe headaches and numbness. In these cases, immediate medical care is recommended. Treatment for blurred vision in one eye can involve wearing prescription glasses or lenses, but there are other steps you can take, such as doing eye exercises to help your eyes focus at varying distances. Your ophthalmologist can explain these exercises. Below are some other suggestions for treating blurred vision. Watching TV—when watching television, you can keep the room softly lit so that it reduces the strain on the eyes. Reading——place the source of light behind you and direct light onto your book or task that you are doing. Fine/minute work—take periodic breaks to ease your eye muscles. Eye muscle relaxation—placing your elbows onto a desk with palms facing upwards, drop your head into your hands and cover your eyes with your hands. Close your eyes and breathe deeply. Do this for about 30 seconds several times a day to relax your eye muscles. Eye massage—massage the orbits of the eyes gently every day to ease the strain. Eye drops—use artificial tears, especially if you feel you have dry eyes. There are preservative-free eye drops available. Eyeglasses—select the right eyewear, including sunglasses. Discuss what is best with an optometrist. Once you have been diagnosed, follow the treatment recommended by your heath care provider. It is also important to have your eyes examined on a regular basis. Blurred vision can be very difficult to cope with, even when it’s just in one eye. It can make routine tasks not only hard but also dangerous. If you notice constant blurred vision in one eye, do the right thing for yourself and those around you. Don’t drive or take on tasks that could harm you or someone else and seek medical attention. If addressed in time, blurry vision can be resolved so you can resume your usual activities within a relatively short period of time.